Biodegradable plates and platters are the perfect alternative to traditional throw away plates that are so popular for summer parties and any other time of the year. Many are even made of compostable material. There are many types of recyclable materials that are used in plates and other tableware. Some are relatively new while others have been used for quite some time. Recycled milk cartons, recycled paper, and other post-consumer waste products are finding their way into many types of disposable tableware; however, this is not new since many companies have manufactured products from these recycled materials for years. Believe it or not, purchasing recyclable plates may be as easy as buying the same Chinet plates that your parents did. Chinet is made from post-industrial waste. They mainly use defective milk cartons that were manufactured but weren't useable for various reasons. The plastic is separated from the carton and the pulp is then used for the manufacturing of Chinet plates. Chinet plates are both biodegradable and compostable. Since they are recycled they also help to keep materials out of the landfills. Most conventional grocers carry Chinet plates and platters. Bagasse is the sugarcane fiber that is leftover from the sugar-making process. Sugar cane is completely renewable and can be turned into almost anything that is normally made from paper or plastic. By finding a need for this leftover fiber, manufacturers avoid creating air pollution that's caused by the burning of the fibers; the way that it was discarded in the past after the juice extraction process was completed.Food served on Bagasse plates and platters won't soak through. Not only do they have a tropical look, the plates and platters also have a nice, reedy feel. PLA is made from corn and has the look and feel of traditional Styrofoam. Companies like Newman's Own Organics, Wild Oats, and even Wal-mart have been using this material for containers over the past year. Palm leaf plates are elegant and they feel nice in your hands. Food won't soak through the leaves. The plates are biodegradable and are made from palm leaf sheaths. No trees are harmed in the harvesting process since the sheaths are naturally shed by the Adaka Palm tree, which grows in southern India.These sheaths are collected from the forest floor and then processed to make plates and platters. More and more stores are listening to consumers and stocking recyclable products, including plates and platters. Look in the same section as the other disposable products. If your grocer doesn't carry them, then you might ask the manager to consider ordering them. Another alternative would be to check with your local party supply, health food or natural food store. You may not be able to find biodegradable plates and platters in your local grocery store, but a little searching on the Internet will yield a number of possibilities. 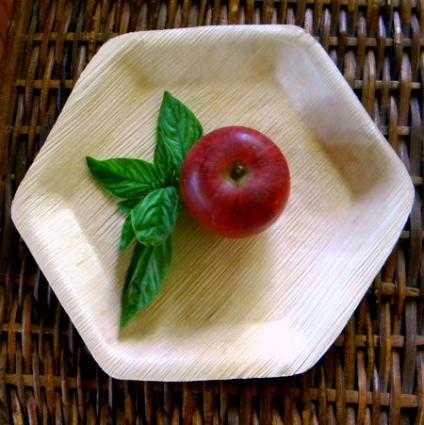 Biodegradable plates are made from a variety of materials, including post-consumer waste products. Don't let this put you off. During the process of producing the plates and other tableware the materials are heated to extremely high temperatures and go through many processes that sterilize the materials and make them sanitary and safe to use. If you plan on composting your plates, then be sure to rinse off any meat or animal-based residues, since it can attract vermin to your compost pile.